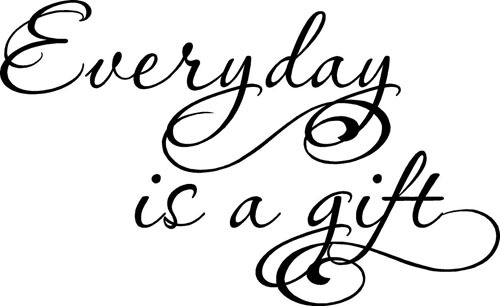 My grandmother always used to say that "everyday is a gift" so don't take your life for granted. I am not a fortunate enough man to have met my grandmother, but my dad still reminds me to this day some of the things he had learned from her. Those words had never resonated in my ears correctly until my dad and I had recently discussed the topic thoroughly. We had began talking about it and we finally understood that we cannot fully realize this message until we have lived that way. Don't take things for granted! - If you can read this message, you are more fortunate than 3 billion people in the world who cannot read at all. - If you have food in your fridge, clothes on your back, a roof over your head and a place to sleep, you are richer than 75% of the world. -If you have money in your bank, your wallet, and some spare change, you are among 8% of the world’s wealthy. These are just a few points that I believe are extremely important to think about when talking about how good we have it. Think about it...If you are simply reading this message, you have been educated better than 3 billion other people. That is amazing to me! My co-worker talked about a few other bullet points in her article titled The Power of Gratitude. These bullet points seemed to resonate in our office and truly took hold of how we think and how we act towards not only each other, but also ourselves. A couple of my friends and I decided over dinner a few months back that instead of giving up something tangible for lent, we would give up taking things for granted. We didn't realize what we were doing until a couple months later. In those couple months it was amazing to see our attitudes change towards ourselves and also towards others. I have lived a short life so far, but I truly believe that living every single day like it is a gift can make a powerful and positive change on anyones life. Great sentiment, David! Looking for the positive things in everything and everyone always feels so good! As you and your friends have experienced, life then becomes magical! This is my first time visiting your blog and I can tell I will be regularly checking out your posts! Very positive message. Sometimes we can only see the negative and that clouds are vision from all the beautiful blessings that surround us. Your statistics in the beginning of the post really gives some perspective on how fortunate most of us are. I hope to provide you with more content that can help open peoples eyes to changing their thinking and also bring some sort of happiness to their lives!